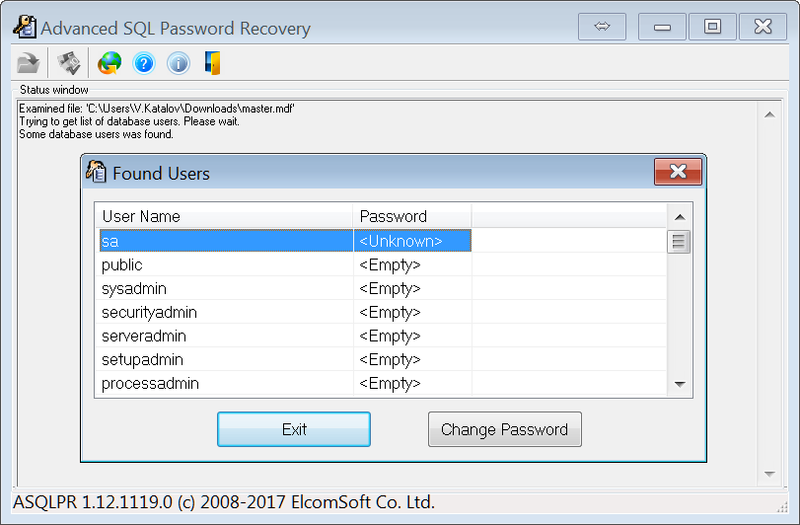 Advanced SQL Password Recovery | Elcomsoft Co.Ltd. Instantly replace or reset lost or forgotten user and administrator passwords protecting Microsoft SQL Server databases. Advanced SQL Password Recovery supports all versions of Microsoft SQL Server and Microsoft SQL Server Express Edition up to the latest 2017. No need to install Microsoft SQL Server to recover a password! Unlock password-protected databases from any PC. All you need to replace any user or administrative password is Advanced SQL Password Recovery and master.mdf file. Get instant control over locked databases no matter how many instances of Microsoft SQL Server are running. Advanced SQL Password Recovery detects and stops the MSSQL service automatically to prevent it blocking access to the master.mdf file. No matter how long and complex the passwords are; Advanced SQL Password Recovery will reset or replace passwords of any length and complexity, in any language and encoding. Advanced SQL Password Recovery operates instantly with no lengthy attacks or advanced settings. Just run Advanced SQL Password Recovery to instantly reset passwords in any SQL Server database! Advanced SQL Password Recovery supports all versions Microsoft SQL Server and Microsoft SQL Server Express. Advanced SQL Password Recovery is guaranteed to instantly replace user and administrative passwords on any password-protected database in Microsoft SQL Server 2000, 2005, 2008, 2012, 2014, 2016 and 2017 format. Long, complex or international passwords are instant to reset with Advanced SQL Password Recovery. Trial version only shows the list of users that have access to the given files (along with their security roles), but does not allow to change/remove passwords.